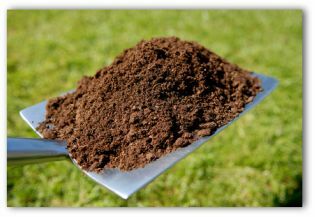 What are the best compost bin designs, ideas and plans for recycling kitchen and garden waste into nutrient rich soil? 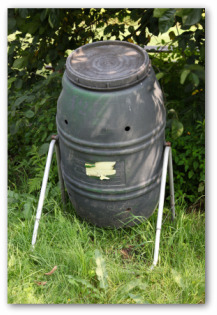 Use our simple plans to build a compost bin in your own back yard! Even the simplest of compost bins can keep decomposing wastes tidy and compact. With enough of the right mix of ingredients, it will generate the heat needed to ensure speedy decomposition. For freestanding compost piles or those in open bins, start with a heap measuring 3 feet wide, deep, and high. 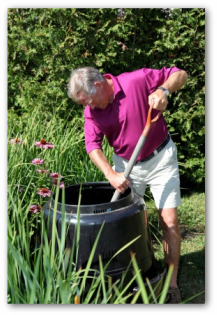 There are ready-made composters available at home and garden centers that are easily constructed and inexpensive. Or, you can easily construct your own compost bin design. Recycle your kitchen, lawn, and garden wast into nutrient rich soil that is great for vegetable gardening! 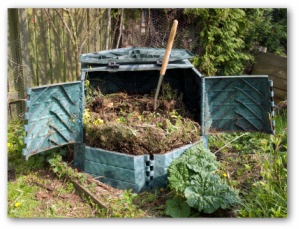 Here are some easy do-it-yourself methods of building a simple compost bin at home. Build your own compost bin of cinder blocks. 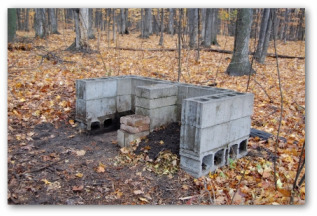 Decomposing waste occupies one of two cinder-block bins in this plan. The opposite side stores finished compost. The spaces between the blocks allow air to circulate. Mortar the blocks at the back and sides of the bins, but leave the front blocks free to remove the compost. For building a compost bin of wire, wrap a length of hardware cloth 4 feet wide and 12 feet long around two stakes hammered into the ground. Secure the ends of the hardware cloth with wires. 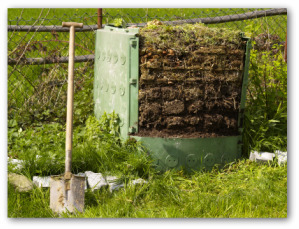 To aerate the compost pile, unfasten the cylinder, reposition the stakes adjacent to the loose pile, reassemble the cylinder, and turn the heap with a garden fork. 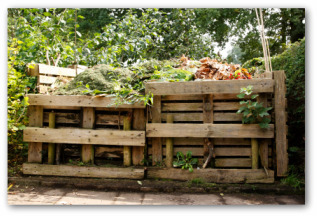 To build a compost bin of wood, construct a 4' X 4' portable bin using four sides made of 1 x 6 boards fastened to 2 X 4's. Hinge one of the sides creating a door for the bin. Set up the bin close to your vegetable garden if possible. A 10' length of 4' wide welded wire fencing forms a circular compost pen slightly larger than 3' in diameter. Fasten the ends of the fencing together with wire or reusable clips. 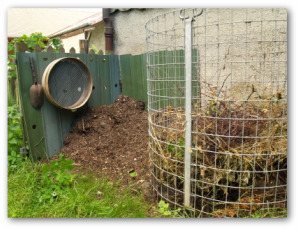 Turn the compost by unfastening the fencing. Set up the pen next to the freestanding pile, which can be turned into the now empty pen. To direct moisture into the center of the heap, drive a pole or length of pipe into the ground in the center of the pen so that it extends slightly above the top edge of the pen and the compost. The plastic compost barrel is designed to produce compost in a month or less. The barrel rests on rollers; turning a handle rotates the barrel and aerates the contents thoroughly. Finished compost is removed through a hinged door on the barrel. A finished batch must be removed before starting a new one. A compact compost bin is an excellent choice where space is limited. Fresh waste material can be added continually to the top of the bin while older matter is decaying. Compost is retrieved for the vegetable garden by pulling out the drawer at the bottom of the bin. Adequate air circulation enters the bin through large slots on the sides, which make turning the pile unnecessary. 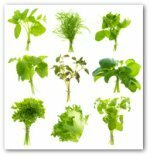 Q. I decided to give organic vegetable gardening a try by composting all my plant debris, trimmings, old foliage, and weeds from the garden. It seems I have more weeds, disease, and insects than ever! What could be wrong? A. 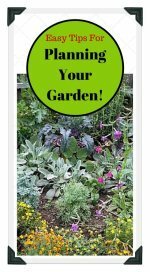 The answer is you are probably composting weeds that have seeds, giving them a fertile place to germinate before returning them to the garden bed to grow strong. Instead, put weeds that have gone to seed in the trash. Take care not to compost any diseased plant foliage. Many disease-causing organisms have resistant spores or go through resting stages that can survive the rigors of the composting process, especially if the pile does not heat up sufficiently. Lacing your compost with 5-10-5 fertilizer or a compost activator, and turning it helps generate the heat needed to kill insect larvae and disease organisms that find a way into the compost bin.